You are here: Home / Ethnic Groups / The People of Java / Who are the Jawa Serang? Who are the Jawa Serang? The Jawa Serang live on the island of Java in the Province of Banten. Serang is Banten’s capital, which is why they are called the Jawa Serang or Jaseng. The term “Jaseng” is widely known among the people in the neighboring province of Lampung. The Jawa Serang are also called the Banten people. In their area, the Jawa Serang live together with Jawa, Banten, and Sunda, as well as other groups. The Jawa Serang arrived in the Serang area centuries ago. From 1525-1526, the army of the Kingdom of Demak (an Islamic kingdom on the north coast of Java) moved from Demak along the coast as far as the Sunda Strait under the commander Fatahillah. The army took the lands along this route. However, the Kingdom of Demak collapsed and Fatahillah established his own kingdoms in Demak and Cirebon. In 1526, the Kingdom of Banten was established, but a group of soldiers from Demak stayed in Banten and founded the Banten Jawa community. The Jawa Serang speak their own dialect of the Jawa language. 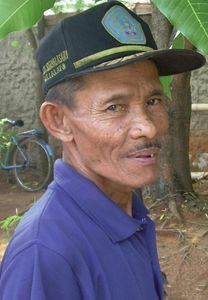 Jawa people who come to Serang generally need time to adapt to the language before they can understand the Jawa Serang dialect. The Jawa Serang have two main sources of income: farming and commerce. Rice is an important commodity in their communities. The province of Banten is well known as one of the major rice-producing areas of Indonesia. The Jawa Serang also engage in many commercial activities. Ironically, although the Jawa Serang live in an industrialized area, more than 50% of the population live below the poverty line. Per capita income in the area is quite high, but there is a wide gap between the rich and poor. This represents a dangerous social situation, which causes resentment between social classes and increased crime rates. The majority of the Jawa Serang are Muslim. However, the Jawa Serang still possess knowledge of black magic, which is commonly used in daily life. Many people from outside the area come to Banten asking for assistance in the form of black magic. In addition, the grave of Sultan Hasanudin, as well as several other graves, are important shrines for the community. The Jawa Serang, especially the poor among them, need assistance in increasing the standard of living and level of economic development in their area. Particularly, assistance for poverty alleviation needs to be directed to those who truly need it so that the poor who receive such help can be reached with maximum impact.